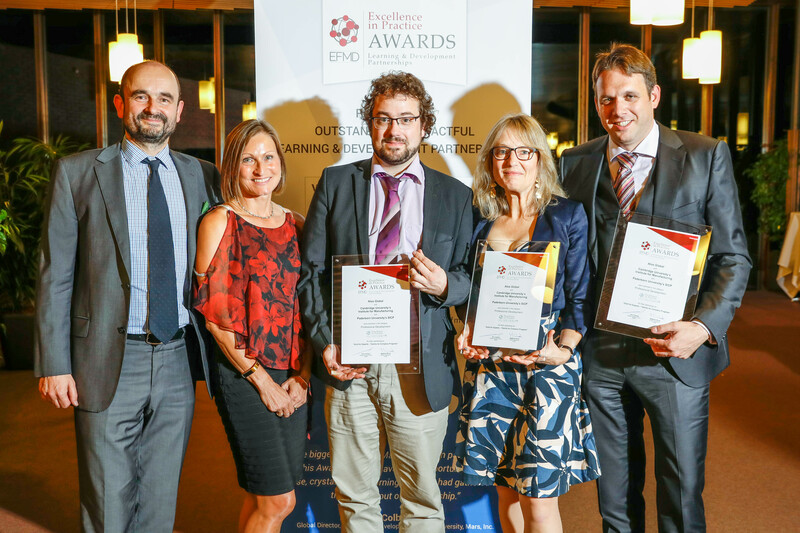 The project „Gold for Experts – Talents for Company Progress”, founded in 2013 by three partners, was awarded with the “EFDM Excellence in Practice Silver Award”. The winners proudly accepted the prize on the October 18 in Lausanne. The cooperation with Atos and the Institute for Manufacturing of the University of Cambridge was rewarded this October. The SICP, Software Innovation Campus Paderborn, and its partners received the “EFDM Excellence in Practice Silver Award for their “Golf for Experts Program” in the category “Professional Development”. Not only did the program “Gold for Experts” receive an award this October, but it furthermore celebrated its five-year-anniversary with more than 300 participants. The program distinguishes itself by the strong partnership, that build it and keeps it updated on the latest technology innovations and business strategies. The project focuses on training talented technology-experts and giving them the opportunity of a career with Atos. It allows its participants to grow, to expand their network and to be aware of the possibilities of professional development.